Following the outbreak of the war and the start of the Siege of Boston, British authorities enlisted the assistance of Loyalist merchant Ichabod Jones to assist in the acquisition of needed supplies. Two of Jones’ merchant ships arrived in Machias on June 2, accompanied by the British armed sloop Margaretta, commanded by midshipman James Moore. The townspeople, unhappy with Jones’ business practices, decided to arrest him, and in the attempt, decided to go after Moore and his ship. Moore was able to escape out of the harbor, but the townspeople seized one of Jones’ ships, armed it and a second local ship, and sailed out to meet him. In a short confrontation, they captured Moore’s vessel and crew, fatally wounding him in the process. The people of Machias went on to capture additional British ships, and fought off the landing of a large force intended to take control of the town in 1777. Privateers and others operating out of Machias continued to be a thorn in the British Navy’s side throughout the war. 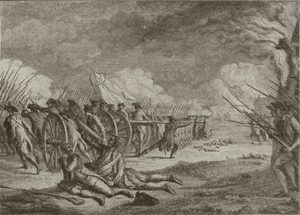 On April 19, 1775, the American Revolutionary War began with the Battles of Lexington and Concord in the British Province of Massachusetts Bay. Following the battle, the militia that had mustered to oppose the British besieged the city of Boston where the British troops were located. Boston’s British military leaders, Admiral Samuel Graves and General Thomas Gage, both had reason to do business with the people of Machias, a small coastal logging community located in what is now eastern Maine, but was then part of the Province of Massachusetts Bay. Gage required lumber to build barracks for additional troops arriving in the besieged city. 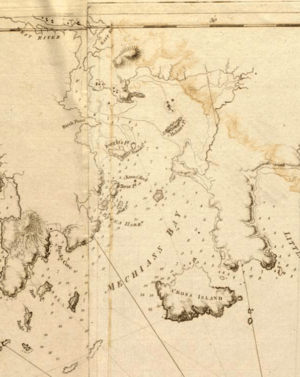 Graves wanted to recover the guns from the wreck of HMS Halifax, which had apparently been intentionally run aground in Machias Bay by a local pilot in February 1775. The ship’s guns were reported to be of interest to the Patriots of Machias. Graves authorized Ichabod Jones, a Tory Machias merchant who had ships in the port of Boston, to take flour and other food supplies to the town of Machias aboard his two ships Unity and Polly in exchange for Gage’s needed lumber. To guarantee that this would happen, Graves sent the armed schooner Margaretta (sometimes also spelled Margueritta or Marguerite in historical accounts), under the command of James Moore, a midshipman from his flagship HMS Preston, to accompany the two merchant vessels. Moore also carried orders to retrieve what he could from the wreck of the Halifax, which they would pass on the way. On June 2, 1775, Jones’ ships arrived in the port at Machias, while the Margaretta was delayed retrieving the guns from the Halifax wreck. Jones met resistance from the community by refusing to sell his pork and flour unless he was allowed to also load lumber for Boston. In a meeting on June 6, the townspeople voted against doing business with Jones. The hostile climate led Jones to ask Moore to bring the Margaretta within firing distance of the town. This prompted the town to meet a second time; this time they voted to permit the trade, and the Unity was docked at the wharf to begin unloading. Following the vote, Jones announced that he would only do business with those who had voted in favor of trade. This angered those who had voted against, and Colonel Benjamin Foster, a local militia leader, conspired with militia from neighboring towns to capture Jones. Their plan to seize him at church on June 11 failed when he noticed the group of men approaching the building. Jones ran into the woods, from which he eventually emerged two days later. Moore and his second-in-command, who were also attending the services, also managed to get back to their ship. Some of the militia men boarded the docked Unity, removed the remaining supplies, and also removed her sails. Others went around by land near the place where the Margaretta was anchored, and demanded her surrender. Moore refused, threatening to fire on the town. This threat was more bluster than real, as Margaretta sported only a few mounted guns capable of firing one-pound shot. More of the militia men rowed out to the Polly, which was anchored downstream from the Margaretta, and attempted to tow her into the harbor. This attempt failed when she ran aground, possibly due to low tide. Moore raised anchor and came alongside Polly, intending to recover her. After a brief and inconsequential exchange of gunfire with the militia men on the shore, however, he again raised anchor and went further downstream to a safe anchorage. The next day, the men of Machias regrouped. Foster took about 20 men to East Machias, where they commandeered the Falmouth Packet, a local schooner. The remaining men commandeered the Unity. They rerigged her, installed some planks as a makeshift breastwork to serve as protection, armed themselves with muskets, pitchforks and axes and then set out after the Margaretta, which by that time had reached the waters of Machias Bay. Moore had brought aboard as pilot one Captain Toby, near whose sloop he had anchored overnight, and was looking to depart the scene. In jibing into brisk winds, however, the Margaretta’s main boom and gaff broke away, crippling its navigability. As a result, once in Holmes Bay, Moore captured a sloop, took its spar and gaff to replace the Margaretta’s and also took captive its pilot, Robert Avery, of Norwich, Connecticut. The Unity crew, about 30 Machias men, elected Jeremiah O’Brien as their captain, and then sailed out to chase down the Margaretta. As the Unity was a much faster sailing vessel, O’Brien’s crew quickly overtook the crippled Margaretta, while the Falmouth Packet lagged behind. Maine historian Roger Duncan, among others, indicates that both the Unity and the Falmouth Packet engaged the Margaretta, but other sources disagree. Early 20th-century Machias historian George Drisko claims that the Falmouth Packet either ran aground or never caught up to the Margaretta, and that the men aboard the Unity alone battled the Margaretta directly. Seeing the Unity approaching, Moore opened full sail and cut away his boats in an attempt to escape. As the Unity pulled closer, he opened fire, but the Machias crew managed to avoid that fire and pull alongside the Margaretta. It took two tries, but they tied alongside and stormed on board the Margaretta, led by O’Brien’s brother John and Joseph Getchell. 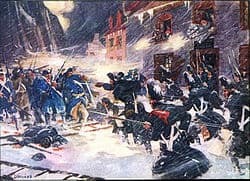 Both sides also exchanged musket shots, and Moore tossed hand grenades onto the Unity until Samuel Watts took him down with a musket shot to the chest. As Duncan reports, the Falmouth Packet then managed to pull along the other side of the Margaretta, and the combined crews overwhelmed the Margaretta. As Midshipman Moore was grievously wounded, his second, Midshipman Stillingfleet, surrendered the crew and vessel. Moore was taken into care in Machias at the home of Stephen Jones, the nephew of Ichabod Jones, but died the next day. At least three other members of Moore’s crew were also killed, as was Robert Avery, the colonist taken by the British. The remaining crew members of the British schooner were held at Machias for about a month, and were eventually handed over to the Massachusetts Provincial Congress. There were also reports circulated, likely exaggerated, that as many as 100 British men died in this and other skirmishes in the Machias area. Machias lost two men, John McNiell and James Coolbroth. Coolbroth died after the skirmish of his wounds. Three others were badly wounded but survived. They were John Berry, who had a musket ball enter his mouth and exit behind his ear, Isaac Taft, and James Cole. The Machias community, expecting the full wrath of the British Empire in revenge, immediately petitioned the Massachusetts Provincial Congress for guidance, supplies and assistance. They organized for the defense of Machias and maintained vigilance in the event of British retaliation. Jeremiah O’Brien immediately outfitted one of the three captured vessels (sources disagree on which vessel; Polly and Unity are both mentioned, and historian James Volo suggests that recent scholarship favors Polly) with breastwork, armed her with the guns and swivels taken from the Margaretta and changed her name to Machias Liberty. In July 1775, Jeremiah O’Brien and Benjamin Foster captured two more British armed schooners, the Diligent and the Tatamagouche, whose officers had been captured when they came ashore near Bucks Harbor. In August 1775, the Provincial Congress formally recognized their efforts, commissioning both the Machias Liberty and the Diligent into the Massachusetts Navy, with Jeremiah O’Brien as their commander. 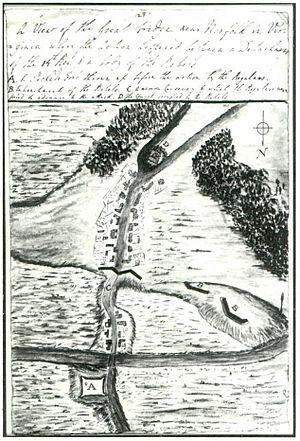 Following rumours that an assault on Nova Scotia was being planned, with stores stockpiled at Machias, a small British fleet carrying 1,000 men attempted to take Machias in August 1777; the locals successfully fought off the landing. The rumors were only partly true; the idea had been proposed, but no significant military planning had taken place. During the war, Machias men refitted and armed a variety of ships—including the Margaretta—and sailed off looking for battle with the British. Jeremiah O’Brien and John Lambert were both commissioned into the Continental Navy. The Machias Liberty and the Diligent were used to intercept merchant ships supplying the British in the siege of Boston. John and Jerry O’Brien built a twenty-gun ship and began privateering under an American letter of marque. Jerry was captured off New York late in 1777; he escaped from prison in Britain, and continued privateering throughout the war. There is a widely told story concerning this affair that Machias men erected a Liberty pole after meeting in the Burnham Tavern to discuss the battles of Lexington and Concord. This story, which persists in modern history books and travel guides, has been shown to be an 1831 fabrication by Machias resident John O’Brien. There is no mention of the Liberty pole in any earlier accounts, including the official report sent by the residents of Machias in 1775, and the letters of other participants in the events.